Students who are visually impaired or blind, face unique challenges that other students may not even consider. There will be obvious barriers and obstacles for the visually impaired student but earning a degree is certainly possible. Many organizations, schools, and associations have put together substantive resources to help visually impaired students which we will discuss in great detail. What are the types of visual impairment? There are a number of types of visual impairment and characteristic that come with each we need to cover. We will dive into a series of different non-corrective vision problems and clinical types of impairments for educational purposes. Clinically speaking, a student will need to meet certain criteria in order to be classified as visually impaired; however, for discussion purposes, we will address several types of sight limitations, technological advances, and resources for students. Low Vision. A person with low vision has moderate to low vision that cannot be corrected or reversed. The typical range of sight is between 20/70 – 20/160 for a person with low vision. Legally Blind. The sight range is between 20/400 – 20/1000 with severe low vision. This is very close to total blindness and classified as a profound vision impairment from a clinical standpoint. Totally Blind. As the name of the classification indicates, this is when a person lacks perception of light known as complete visual impairment or total blindness. Refractive errors are the most common type of eye impairment which includes astigmatism, nearsightedness, and farsightedness. By in large, refractive errors in the eye are correctable through the use of contacts and/or corrective lenses. An astigmatism is a medical term used to describe when the spherical curvature of the eyeball adversely affects light rays from meeting a common focus. People who have an astigmatism struggle to see both near and far. A nearsighted person is unable to see things clearly unless they are relatively close in proximity as images are focused in front of the retina. As a result of this condition, a nearsighted person can see things up close while objects far away appear blurry or out of focus. On the other hand, farsightedness is when an image is focused behind the retina making objects up close a challenge to see clearly. Another common type of correctable eye impairments is a lazy eye. The clinical term is known as amblyopia may or may not affect vision depending on the specific instance. A person with amblyopia may have one or both eyes affected and can be shifted either in or out from a resting center position. The inherent danger of not addressing a lazy eye is the fact that amblyopia arrests the affected eye minimizing both activity and strength. Corrective options for a lazy eye include therapy, an eye patch, and corrective surgery. Strabismus or heterotropia is a condition whereby a person is unable to utilize both eyes to focus on the same fixated point. In other words, the eyes to not properly align with one another due to an imbalance in eye muscles or eye muscle strength. Retinitis pigmentosa is a hereditary eye disease most often accompanied with a black pigmentation and a gradual degradation of vision. A person with retinitis pigmentosa will often lose a degree of their peripheral vision if left untreated. Cortical visual impairment (CVI) or cortical blindness are both types of neurological visual impairments where the brain impacts the use of a person’s eye functions. The visual cortex causes a change or fluctuation in vision from day to day depending on the type and severity of the impairment. Terry Syndrome or retinopathy of prematurity (ROP) is a condition that affects prematurely born babies as an abnormal growth of blood vessels within the retina and vitreous occurs after the use of oxygen therapy. In many cases, ROP is self-correcting and mild in nature while more extreme examples have lead to total blindness. Fortunate for all of us, we have seen substantive technological advances for persons suffering from eye impairments in the last two decades. We have assembled a list of great technologies that may be useful at school and around the home for a variety of people. Window-Eyes is a software application in the adaptive technology field that effectively converts activities in Microsoft Windows into discernable speech. More information about the maker of Window-Eyes, GW Micro can be found here. Screen-reader technology known as JAWS or Job Access With Speech. The JAWS system was developed for computer users with vision loss thus impacting the ability to see and navigate a computer application. The JAWS system provides users with both speech and Braille output depending on the program being utilized. Finding the best screen reader can be a chore which is why the American Foundation for the Blind (AFB) has assembled a singular portal of options. The screen reader database includes a quick description of the product and a link for users to perform further research to best meet their needs. NaturalReader is a free, simple interface that converts text to speech. Their website illuminates several key features of the software including the ability to learn new languages, sync with a variety of devices, convert any printed document into speech, and designed to aid special education professionals. The Kurzweil 1000 is another text to speech application that allows users to select natural sounding voices to better suit personal preferences and learning styles. Additional product information for the Kurzweil 100 can be found here. 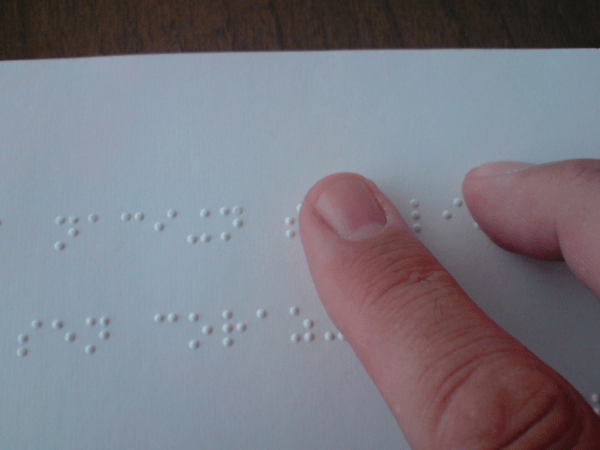 Additional resources can be found by reading the following blogs and resources for those affected by a visual impairment: National Association of Blind Students, Braille Monitor, International Braille and Technology Center for the Blind, AccessWorld Magazine, NFB, Council of Schools for the Blind, Society for the Blind, AFB CareerConnect, American Foundation for the Blind, American Association for Pediatric Ophthalmology and Strabismus, and VisionAware. As you have learned, technology has made some significant strides to better support those with a wide variety of visual impairments. That being the case, there is a need to acknowledge the unique challenges presented to those with an impairment relating to college. The need for great service is met with an obligation for colleges to provide a learning environment and course material that is accessible by persons with a variety of disabilities. Before applying to any college or university, consider the following guidelines to help ensure a successful higher education transition. Advocate for Yourself. You will need to work hard to communicate to professors, teachers, counselors, and staff things you may need. Give input often to those that provide support and want to see you succeed. If these professionals do not know you are lacking resources or additional material, they cannot help you. If you are struggling with a particular subject or assignment, reach out to ask for help. The result may be a quick conversation with your professor, spending time with a tutor, a software enhancement, or a hardware upgrade. In all cases, communicating about your needs will be an important facet to your lifelong success. Get Involved. Make an effort to reach out to campus-based groups or community groups to connect with others. Surrounding yourself with a great support system during your time in college will not only help with the transition but will be a leadership opportunity to help others in their daily walk. Students that make an effort to reach out to connect to groups and stay connected perform better long-term both academically and socially. Leverage Resources. The college you attend will have many resources available to help you reach your potential. As a result, take advantage of these resources and learn how to use them to your advantage. The resources may range from adaptive technology devices to simply being closer to the lectern during class. Research Colleges. Choosing the best college for you is paramount. When researching prospective schools, determine the quality of the assistive technology along with a level of competence from the college staff to help anyone with an impairment. You will also want to validate the fit of the online learning environment and meet with the accessibility team(s) at the school. Be Tech-Ready. In some cases, you will need to bring adaptive technology and resources from home to best serve your needs. If that is the case, come to class prepared with the items you need to be ready to learn whether it is a specific type of screen reader or magnification system in order to thrive in class. For additional resources, make sure to visit MatchCollege and subscribe to our blog for the latest in college information and resources to help you navigate the admissions, financial aid, and scholarship process more effectively.